To update or not to update, that is the question… You bought a brand new booth a few years ago. It has worked great for you, however now it doesn’t seem to draw the same attention as its original release. 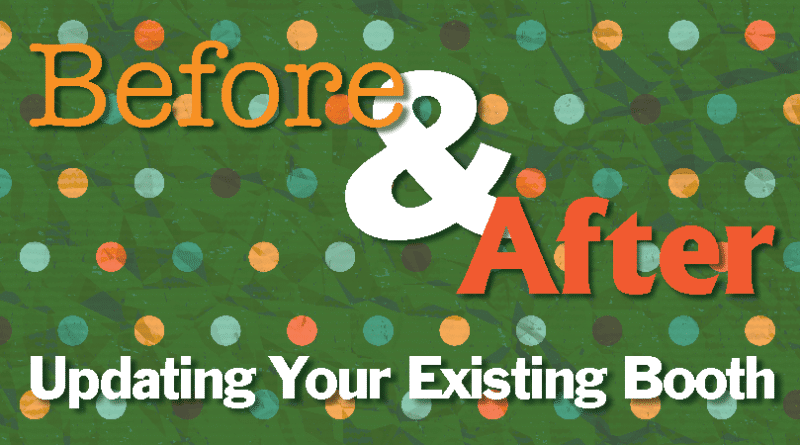 You don’t have the budget dollars to buy an entire new exhibit, yet you need a fresh look. What do you do? No need to say goodbye just yet. Your exhibit still has some miles in it. It’s just time for an update. There are several things you can do to breathe new life into that older exhibit and extend those budget dollars at the same time. Change out those existing graphics and leave the existing hardware. 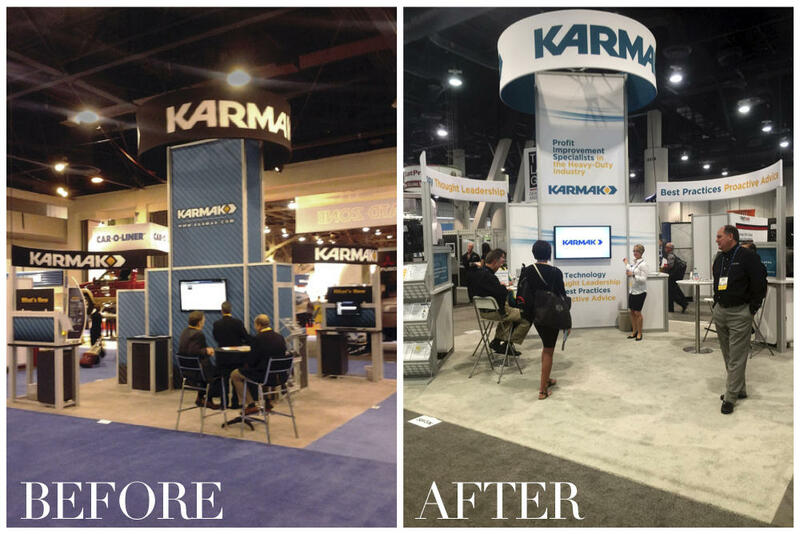 Whether you have new campaign, are changing your message, are introducing a new product/service or just need an update, graphics are one of the easiest, most impactful ways to make your booth look new and different. Custom flooring can change the feel of your booth instantly and set you apart from your neighbors. While other booths may be using typical carpeting, think of adding a wood floor, custom inlay or even a raised floor to set you apart from the other exhibitors. Custom flooring can emphasize your brand and help to compliment your overall look of the booth. There is even data collecting floor technology out there to help you learn more about the traffic patterns of your visitors – helping to potentially increase your ROI. This can be done in various ways, from changing the placement of where existing elements layout to taking those individual pieces of existing metal extrusion and making a completely new design. This not only can change appearance, but can also change functionality of a booth, depending on the needs of the show. Add some color changing accent lights, lightboxes, product lighting or even overhead rigged lighting, literally casting new light onto your exhibit. Strip lighting added under counters and shelves will brighten up your booth and highlight product. A brighter booth, is bound to make people stop and take notice. Consider adding some rental furniture, charging stations and/or iPad stands to change your look. By renting, you are not tied down to using the same thing over again and you can change up the items based on your show plans. One show you may want a place for visitors to relax and have laid back conversations, so casual seating might be your go to. Another show you might be trying to go over paperwork and highlight products in your online catalog – in which bar top tables, contemporary stools and iPad stands would be an appropriate fit. Try to extend your visibility across the show floor, by adding some hanging signage if you have an island or peninsula exhibit. If they see you, they will come. While you’re add it, consider adding a few spots from the ceiling on that hanging sign to really make it pop from the other end of the hall. Think about adding additional footage to your booth along with either a reconfiguration and/or by adding additional elements to your space, such as a presentation or meeting space. A new event, game or action added in your space is sure to bring some new attention. Consider including a touchscreen, iPad or even just a flat panel TV to showcase an interactive game, website or video in your booth. Even a single piece can make an impact and be a crowd generator. Just one of these ideas can really help bring an older exhibit up to date and keep the visitors coming back to your booth. Let us help you with one or multiple ideas when you’re just not ready to move on from your current exhibit!